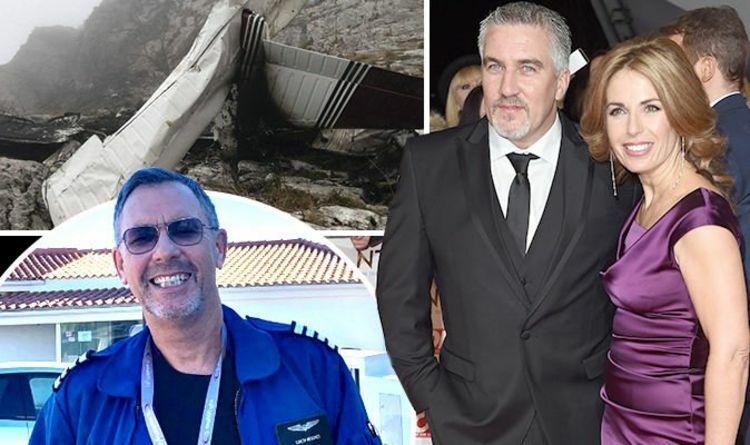 Simon Moores, the brother-in-law of Great British Bake Off star Paul Hollywood, was killed when his light aircraft went down in the Basque Region in northern Spain. The Sun said the 62-year-old – the sibling of the star’s former wife Alexandra Hollywood – died after the plane got caught up in “thick fog”. A representative for Alex confirmed the news to Express.co.uk, saying: “The Moores family respectfully ask for privacy at this difficult time.” The father-of-two from Kent is believed to have been travelling in a Piper Arrow III from the Portuguese town of Cascais to San Sebastian. It is stated that it crashed into Mount Hernio around 2pm, and a second British pilot also died. Just hours before the tragedy, Simon had shared various updates on his trip in view of his 2,141 Twitter followers. “Dawn’s early light – apparently Biarritz make it very difficult to refuel so go to San Sebastián instead,”(sic) he started. The plane could be seen in the corner of the accompanying photo while various others were pictured on the tarmac nearby. Simon has previously hoped for good weather on the micro-blogging site, after sharing a snap of the inside of the aircraft. The publication said locals heard a blast before calling the emergency services and using ropes to climb 1,000 metres to reach the crash site. It is reported the plane was owned by David John Hockings, a business associate of Simon’s. He is thought to have been returning the plane to the UK following a lease. Simon, whose sister was married Paul between 1998 and 2017, ran an aircraft banner business called Airads out of Rochester Aerodrome. The tragic news comes just days after Alex addressed her split from the Channel 4 regular for the first time. She told Prima magazine: “No one should underestimate how separation and divorce can hit you. “I compare it to a moment where you’re driving along the motorway and then the next moment, something beyond your control happens and you’re driving in a completely different direction. The couple first split in 2013. Paul and Alex, who share teenage son Josh together, reunited before separating again four years after. Jeremy Scott’s Latest Moschino Collections Borrowed From Fellini Russia Is Running Low on World War II Soviet Tanks. So It’s Getting Replicas From Laos.